Despite a huge backlog of games trying to get my attention, I found myself playing a lot of Team Fortress 2 (TF2) lately. 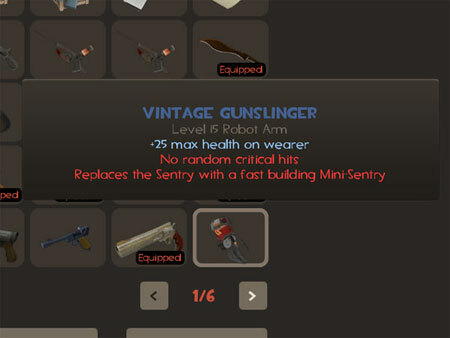 This is in part because of the loot system, which drops random items –mainly hats or weapons– for you to use in customizing your avatar.1 This system has been in TF2 for a while, and it used to be that the only way of getting the gear you wanted was by getting it from a drop or by crafting it from raw materials (which also essentially came from drops). Many players rejoiced and were very proud of their silly hats and weapons. 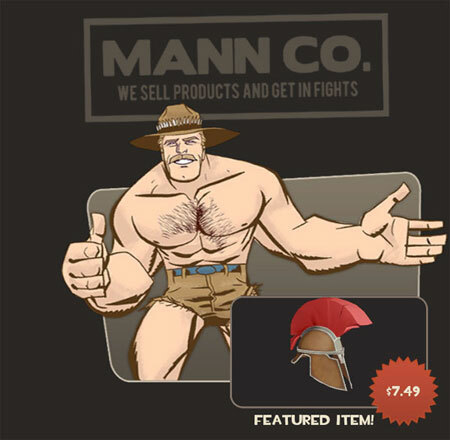 Then, in late September 2010 Valve introduced the Mannco Store, which allowed you to buy –with real money– almost all of the items that you used to have to score from lucky drops. Players were suddenly faced with the prospect that the Kritzkrieg or Backburner that they had been running around with would now be indistinguishable from those bought from the store. Comments began to arise on message boards that this would lower the appeal of those original items, the implication being that the “pre-Mannconomy” versions should be worth more than the new copies readily available in the store. Buy stuff AND get in fights? Double sold! The researchers then had children assign value to the original and duplicate items. Not surprisingly, they valued the original items much more highly because they had history and that history was seen as not transferable to the copies. To see if the same effect would happen when it was YOUR history that went with the object, Bloom and Hood conducted a follow-up study where they offered to duplicate kids’ security objects –for example, blankets or stuffed animals that some kids will never sleep without. Some kids refused to allow their special objects to be subjected to such shenanigans, but for those that did, the researchers offered to let them take home either the original or the copy. Almost all of them chose to keep the original. Bloom argues that this is all because we perceive items as having essences based on their history or who they belonged to. I’ve written about the endowment effect, which causes us to value an object more once we own it. Similar thing. And I don’t know if Valve was thinking of blankies and teddy bears when they rolled out the Mannco store, but they did apparently realize that items with a history –that is, that were acquired from drops before they were available to buy– would be seen as more valuable and players would feel a sense of loss if it was suddenly considered –or perhaps more importantly seen as– equivalent to readily available duplicates. It also has +10 psychological weight. Their solution: put the word “Vintage” in front of the item. So “Force of Nature” is what you can buy from the Mannco Store or find via drops after the update. “Vintage Force of Nature” is the thing you’ve had all along. It’s different, even if it looks the same and acts the same and may have been owned by the Queen of England. I’m curious what would happen if Valve ran an experiment where they offered to buy back duplicate items and asked people what they’d sell them for. How much more would the “Vintage” versions of items be worth relative to the non-vintage? I’d guess a LOT more. 1. Hey, by the way, I have an article on the psychology of loot drops in an upcoming issue of GamePro. COINCIDENCE? You decide. 2. Bloom, P. (2010) How Pleasure Works: The New Science of Why We Like What We Like. New York: W.W. Norton & Company. I’d see that as related to MMORPGs in which previously difficult achievements become trivial as a patch is released. I’d say it appears to be the same even for less tangible things like achievements/trophies; more so than with the purely decorative items in TF2, in a sense they’re markers for history rather than objects with history. But would you say that events not marked by any object, such as having killed Onyxia, work in the same way? Any player would say that meant something in original WoW, but once the first expansion came out, not so much any longer… after a while, people began soloing what was previously one of the hardest raids in the game, after all. Or is that a different effect? As an aside, I would say the test with the children actually bears less relevance on what’s happening here than a test with achievements would: in the TF2 instance, players complaining appear to have been working hard (i.e. spending a long time trying) to get their vintage item, and having the same item sold in a store diminishes their work. The comparison would be better if, as you say, vintage items sold for a lot more in player-to-player economies than their non-vintage equivalents… but as far as I understand, that’s not tested? Yeah, I believe there has been other research to show that the endowment effect is stronger the more detailed and longer your history is with an item. So things that people had to work for probably have more weight. And yeah, you can’t sell or trade vintage items. That doesn’t mean they don’t have value, though. Minimum selling price is just often the most convenient way to measure value. I have to wonder if it wouldn’t be worthwhile for Valve to sell “limited edition” versions of items, such as “Gabe Newell’s Kritzkrieg” … scratch that, I have to wonder when that’s going to happen. They’d probably sell for more than vintage items, even. You can get (through the store or drops) a name tag that lets you change the name of any single item. So you could conceivably do that. Battlefield Heroes sells virtual T-Shirts for the soldier avatars. These shirts have probably some history since as a player you’ve already seen a few avatars in-game with this or that particular T-Shirt, and hence created inconciously a mini-story (fight or ally) linked to that particular t-shirt. Now a days most the persons enjoying with the video games and cricket game and other. this is the psychological problem of child. Most of the childs enjoying with video games it is the nature of the childs.. When we showed this machine to children, none thought it was a trick. This fits with other research that finds that children are perfectly credulous about unusual machines. Turns out they’re worth between two and four times as much. In case anyone wondered.